Microtronics has released the Joytyper 400, a standard full-travel keyboard for the Atari 400. The keyboard layout is the same as on the Atari 400/800, except that the right-hand SHIFT key is in the more usual location. The game keys are beside the space bar. The Joytyper 400 has standard gray two-shot molded keycaps. The RESET key has an extra stiff spring, low profile, out-of-the-way keycap. 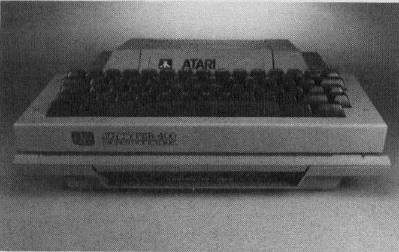 The aluminum case (14″ × 5″ × 1″) is color-matched with the Atari 400. Electronic connection is simple: unplug the membrane keyboard, then plug in the Joytyper 400. Physical attachment: by industrial adhesive strips or by drill and bolt. The Joytyper 400 comes with a 90-day warranty on materials and workmanship. The cost is $129.95 plus $5 postage and handling.